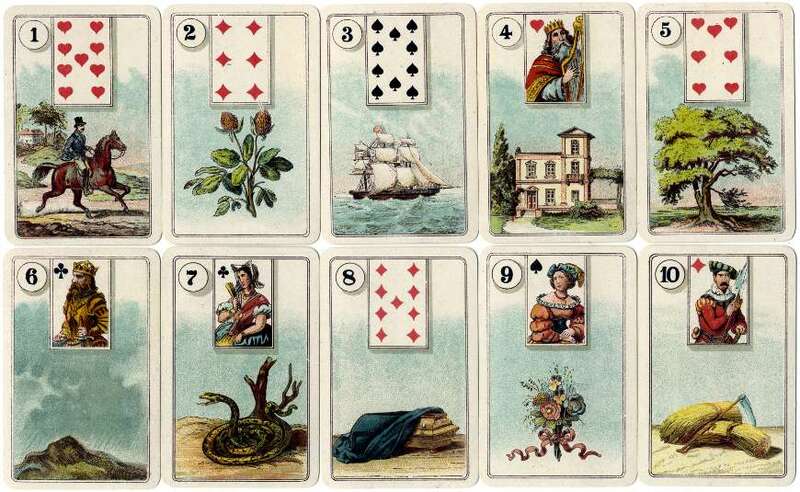 French-suited Cartes Lenormand published by H. P. Gibson & Sons Ltd, London, printed chromolithographically in Germany by B. Dondorf. The set was probably published in the early 1920s because H. P. Gibson & Sons Ltd didn't exist until 1919 after Harry Gibson sold the International Playing Card Co (formed in 1903) to De la Rue. The retail price was 3/6d per pack. Between c.1873 and 1933 Dondorf printed and published fortune telling decks in the style of Madame Lenormand. 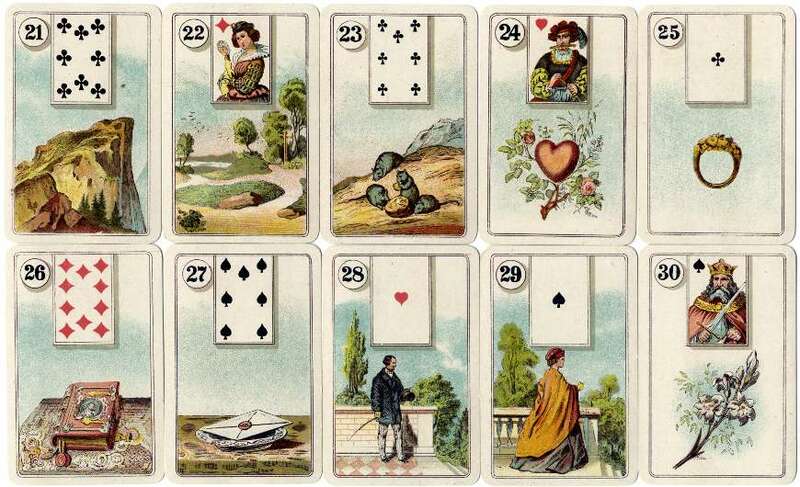 Dondorf also printed Lenormand fortune-telling cards for Carreras during the 1920s. 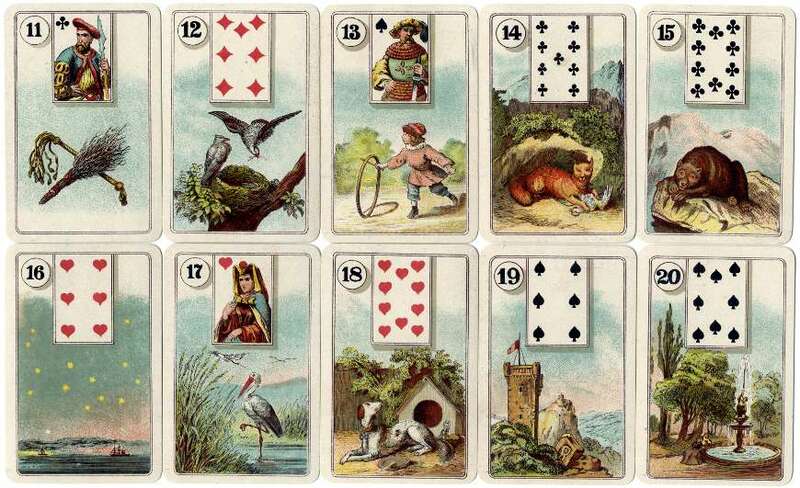 To see a study of the different editions of Lenormand cards click here. Above & Left: Cartes Lenormand published by H.P. Gibson & Sons Ltd, 1920s. 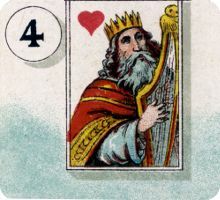 The cards were printed in Germany by B. Dondorf. 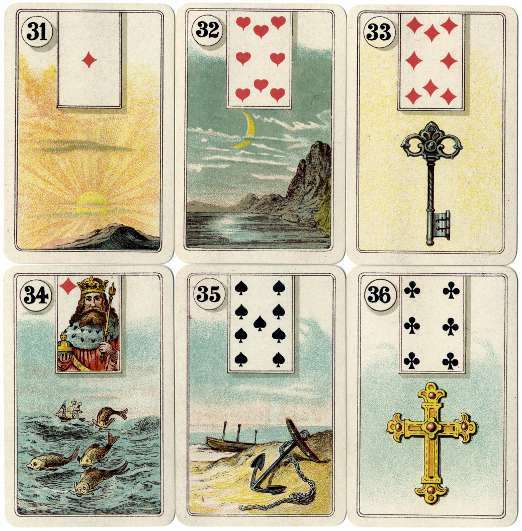 Below: Box from Cartes Lenormand published by H.P. Gibson & Sons Ltd, 1920s. Above: the back of the cards is the standard Dondorf back design, without any manufacturer's details overprinted. 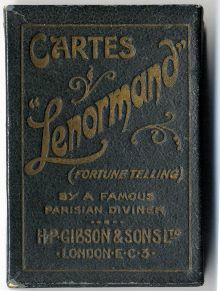 The booklet accompanying the pack states: The Art of Telling Fortunes "Lenormand" as professed by the celebrated Parisian Diviner Sylvia d'Arville - H.P. Gibson & Sons Ltd., London E.C.3. and then goes on to explain that Mlle Sylvia d'Arville is a most celebrated fortune-teller whose grand-mother predicted Napoleon, his greatness and his victories, and his subsequent fall and ruin.